Holly Lisle is moving all of her classes over to a new sight (hollyswritingclasses.com) with way better performance software. Kicking off this move is the launch of How to Revise Your Novel onto the new site. As with any launch she does, there is a lot of free stuff happening in the lead-up to the class sign-up opening. If you’ve ever had a novel that you couldn’t wrangle into a saleable state, this is a great course to take. Even if you don’t end up taking the course, you are going to probably take something away from the prelaunch that was well worth your time. 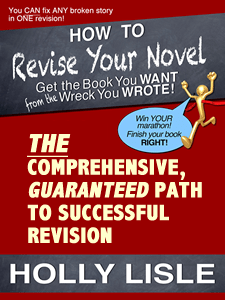 The link for the How to Revise Your Novel launch can be found by clicking on the name. In the interest of transparency, yes I am part of the affiliate program. This isn’t why I promote her classes, but instead is the reverse. I promote her classes only because I have seen that they can be a huge boon to those working to hone their writing. You are free to simply go directly to her new site directly if you prefer and my statement will remain the same.